The national expansion of popular democracy sought by these left-wing reformers was, sadly, never achieved under their party banner. But several decades later, their many ideas for putting government to work for the people found traction during the New Deal. Programs to promote social equality and economic opportunity first tested at the state or local level became a Depression-era lifeline for millions of Americans nationwide. In the twenty-first century, many on the left still yearn for economic and policy victories on the scale of the 1930s and the emergence at the federal level of a counter-force that might one again curb the influence of corporate America. While waiting for that second coming, progressive activists have, like the “sewer socialists” of old, been forced to grapple with serious problems—national and even global in nature—at the municipal level instead. Some of the bravest (or most ambitious) among them have sought and won local elected office. So, in city halls across the country, they are now trying to deploy the limited resources of local government to fight poverty, inequality and environmental degradation at a moment when higher levels of government have failed to address such problems or made them worse. To maintain public support, these reform-minded mayors, city councilors, county commissioners and allied civil servants must be as concerned about street paving and policing as saving the planet from global warming. Until recently, most of these “pothole progressives” have toiled largely in isolation. They chipped away at local injustice or city hall dysfunction in ad hoc fashion with little national infrastructure to sustain or support them. But as their ranks have swelled in recent years, several networks have developed to promote greater coordination of this difficult work through systematic sharing of information, ideas, and technical expertise. Among the “electeds” gathered in New York City for the Local Progress third annual meeting, there was little moping about the Democratic Party’s now much weakened condition in various state capitols and Washington, DC, as a result of last month’s midterm elections. Instead, they and their larger supporting cast of labor and community organizers, public policy advocates and social-change funders all resolved to expand their influence at the local level, where reform is still possible. To hasten this goal, the organizers distributed a sixty-page compilation of “case studies and best practices” from around the country, co-produced with the Center for Popular Democracy. This dense, well-documented guide provides an ambitious blueprint for improving local labor standards, housing and education, policing practices, environmental sustainability, treatment of immigrants, voting rights and financing of elections. Local Progress has recruited 400 members in forty states; about a third turned up for its latest annual meeting, with impressive representation from the city councils of San Diego, San Francisco, Seattle, Tacoma, Denver, New Orleans, New York, Baltimore and Philadelphia. Mayoral participants included everyone from the high-profile chief executive of the host city, Bill de Blasio, to his far less well-known, but equally feisty, West Coast counterpart, Meghan Sahli-Wells. She hails from Culver City, California, a Los Angeles County enclave with a population smaller than some New York City neighborhoods. But that difference in scale hasn’t stopped Sahli-Wells from making waves of her own, as an enviro-oriented “bike mayor” who helped secure a ban on single-use plastic bags and has been working tirelessly to ban fracking as well. Now her talk about property tax reform has local realtors organizing against her and wishing she had never been chosen by her council peers to be the city’s part-time mayor. “My Chamber of Commerce hates me,” she reported, but expressed confidence that “harnessing the power of community” would enable her to overcome business opposition to some of her future plans. 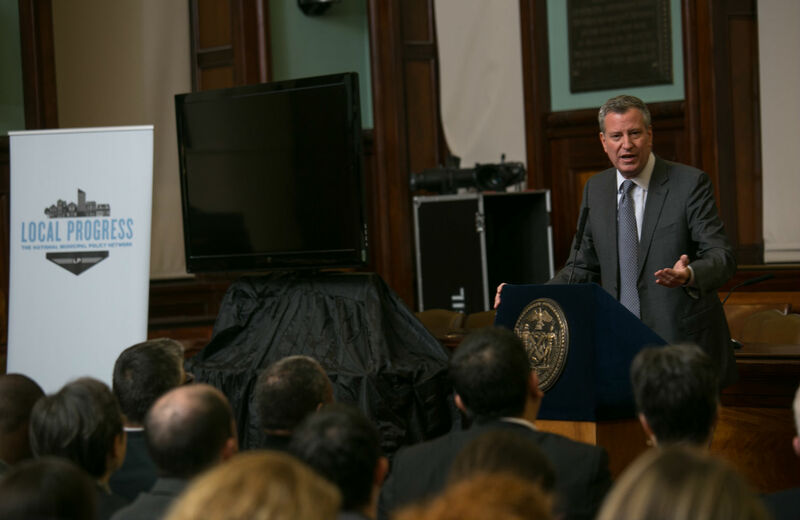 De Blasio welcomed such diverse colleagues amid the ornate surroundings of the New York City Council chamber. He was joined by Council Speaker Melissa Mark-Viverito and Brooklyn councilmember Brad Lander, who both described the salutary effect of having a Progressive Caucus of nineteen in the city’s fifty-one-member leadership body. In the smaller strategy sessions that followed, participants shared information and ideas on a wide range of topics. These included “participatory budgeting”—an experiment now underway in New York City to solicit neighborhood input on spending priorities—and multi-state efforts to expand public financing of candidates for local and county office. According to Emmanuel Caicedo, state affairs manager for Demos who spoke at the conference, this election reform was a key factor in making progressives more competitive electorally in New York City and enabling them, once in office, to expand the reach of paid sick day legislation. “Without this matching funds system, councilmembers would not be able to do the right thing for their constituents, “ he said. Local Progress workshop turnout and the intensity of discussion were both driven, in part, by the momentum of events unfolding outside the gathering. The latest round of national fast-food worker protests and street demonstrations in Manhattan over the grand jury decision in the Eric Garner case provided an urgent backdrop for brainstorming about workers’ rights and major reform of US police departments. On the labor front, city officials were reminded by several speakers from the Service Employees International Union (SEIU) and the AFL-CIO that minimum wage hikes, statutory entitlement to paid sick days, and better enforcement of local labor standards still doesn’t give enough Americans the workplace voice that collective bargaining provides. More needs to be done, they argued, to help workers for government contractors or in public facilities, like airports, to win bargaining rights without management interference. “Having a union is necessary to sustain gains,” Héctor Figueroa, president of SEIU Local 32BJ, pointed out. Few labor allies in Local Progress question the value of unionization—but some did express concern about unions being unhelpful in their own past municipal campaigns. For example, Anders Ibsen, an earnest 28-year-old city councilor from Washington State, sought advice from AFL-CIO Executive Vice President Tefere Gebre about dealing with conservative “business unionists” who’ve tried to thwart progressive initiatives in Tacoma. In the same panel discussion, San Diego councilmember David Alvarez—a recent labor-backed candidate for mayor—recalled the initial opposition he faced from a major AFL-CIO affiliate. According to Alvarez, it took much patient relationship-building to win over this union, despite his strong commitment to local labor causes like taxi-driver organizing. Just how to do that, at the local level, was the subject of much debate at a session on “Winning Real Police and Criminal Justice Reform.” Panelists discussed remedies like requiring police body cameras, retraining officers, recruiting more from minority communities, and offering them financial incentives for local residency. Lisa Daugaard, policy director for the Public Defender Association in Seattle, cautioned against quick fixes, including indiscriminate body camera use and training programs unaccompanied by real institutional change. “It’s easy to hold a three-day training session. It’s very difficult to have training change behavior, habits, instincts,” she said. By bringing both catalysts for change together, in one organizational network, Local Progress is not blazing an entirely new path or one as explicitly anti-capitalist as left movement builders a century ago. But, in a modern political landscape otherwise bereft of many bright spots at the moment, contesting for power locally, in ecumenical fashion, still makes sense for any group of progressives with higher aspirations and longer-term societal goals.